Here we go – the week is winding down! Thursday, always a highlight day in my week as it marks the end… maybe it’s just me who likes Thursday so much? The only downside to the end of the week is that the early mornings start to hit and I feel their impacts. Over the last few months I’ve found myself answering the same questions for people about food so I thought it would be helpful to share some tips here, for more of you to read! These are just some things that I do because I love them and they work for me. Maybe they’ll work for you too, maybe they won’t, but either way they might spark some other ideas for you to take to the kitchen. How do you make fish more edible? I’ll admit that I never ate fish before I started to compete (other than canned tuna). So, when it became a required food, Kyle and I set out to find ways to make it more enjoyable. We started with lots of seasoning, and then found this cooking method which has honestly made me love eating pretty much any fish. That’s something I never thought I would say! The magic word for this is “broil”. That’s it! We buy our fish from the freezer section at Costco, and cook it right from frozen. Cook it at 350 until it’s cooked through, then turn your oven to broil (550 on ours) and leave it until the top of the filets are brown. I love how this dries the fish out and puts a little crunch on it. It might not look incredible here (I’m not a food stager by any means), but it’s incredible. Even better with some Franks Red Hot!! Added tip – the best salmon EVER! 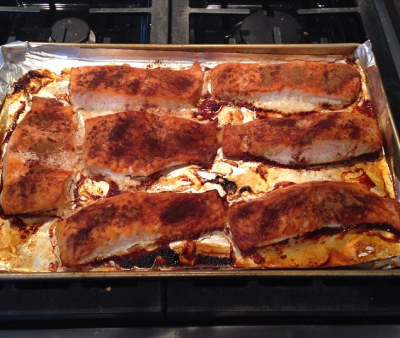 Before putting the oven on broil, put cinnamon on the salmon (I’m pretty generous with it so the fish is pretty much coated). Broil until done. If you want to take it even further, when you serve it, add some Frank’s hot sauce – the sweet / spicy mix is great. Amazing and so easy! I don’t remember the last time I ate pasta, but these veggie noodles are a staple in our meals lately. 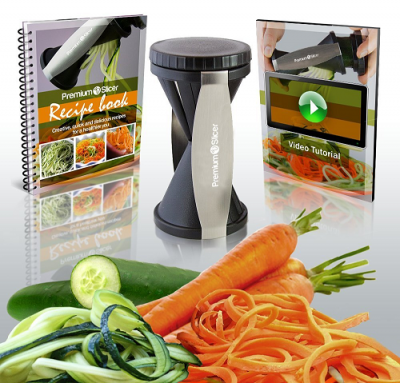 The veggie spiralizer was an impulse buy from Amazon… basically just to qualify my purchases for free shipping (you know you do it too!). Chalk it up to be a truly successful impulse buy though as it gets used about five times a day! We tried one of those basic julienne tools – didn’t cut it. This is WAY better! And, it’s available at Walmart. Everyone has Walmart. We’re going through a lot of zucchini with this tool, which is a great addition to any meal plan. It’s filling without adding much in the way of calories other than some helpful nutrients (fibre and Vitamin A namely). Some people will actually cook their noodles, but we don’t – they just go into our meals raw. They’ll get warmed up in the microwave at meal time, but that’s about it. I sauteed them once, but it wasn’t worth it because they shrunk so much. Just twist some onto your plate and you’re done! 3. Your food always smells so good! What is it? It never ceases to amaze me when people comment on our food at work – because it’s not overly exciting (chicken, rice, and veggies with some hot sauce and mustard?). But, I have to admit, when I take the time to saute my meals, they do taste and smell amazing. Sometimes just doing things a little different, even to the same foods, can have a big impact on taste. Get creative and throw in any veggies you want, and plenty of seasoning for taste. Keep in mind how long certain veggies will take to cook compared to others – you don’t want some to be mush while others are still kind of raw. One of my favorites – spring mix salad, broccoli slaw, diced red onions, chicken, and seasoned with oregano, garlic powder, and sriracha. The combination of the seasoning with the wilted salad is really good. Again, it doesn’t need to take long – just throw some veggies (even frozen ones) into a pan with some meat and season it. There you go, just a few easy tips for ways we make our healthy food a little different and add some new tastes or textures. Give them a try! Happy cooking! I'm passionate about health and fitness. I work as a Health Promotion Specialist, a group fitness instructor, and also a coach for physique competitors / weight loss clients. I grew up as a competitive athlete, and have continued with this passion as a Women's Physique competitor. Research and writing is another interest of mine, which I use to share my knowledge with the general public. 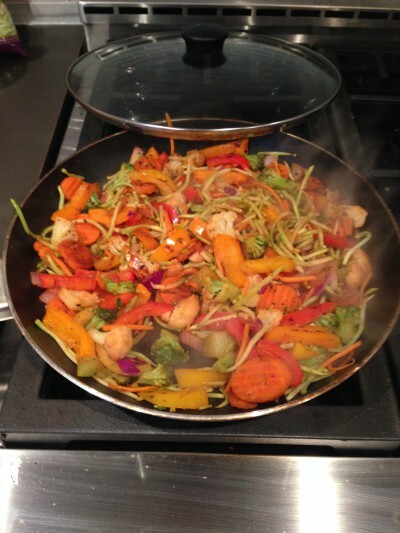 This entry was posted in Education, Food, Health, Lifestyle, Nutrition, Personal, Recipe, Wellness and tagged cooking, cooking tips, eat clean, eat well, food, foodie, health, healthy eating, lifestyle, meal plans, recipe, tips, wellness. Bookmark the permalink.